Eagle’s Nest is located on the spot above the “Big Eddy” on Eagle Fork Creek. 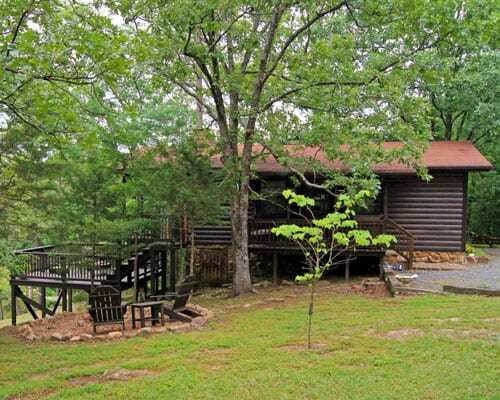 The front of the cabin features a covered porch with two chairs and table to sit and enjoy the sounds of the birds or watch the deer as they cross the common area with it’s enormous pines and hard woods. The view from the double deck in back is nothing short of spectacular. The aquamarine color of the creek water is absolutely beautiful as it winds thru the valley. The Kiamichi and Quachita Mountains in the background brilliantly show off the greens, golds, reds and browns of the cascading trees. Nothing sounds neater than the whispering pines as the wind blows gently through their branches.